I’m delighted to bring you a seamstress who has a black belt in sewing dresses for girls. And lucky her, she has five girls to sew for and one adorable boy, too! Katy is joining our panel for the Swingset Skirt sew-along. What has she got in store for her Swingset skirt? Read on to find out. Hi! 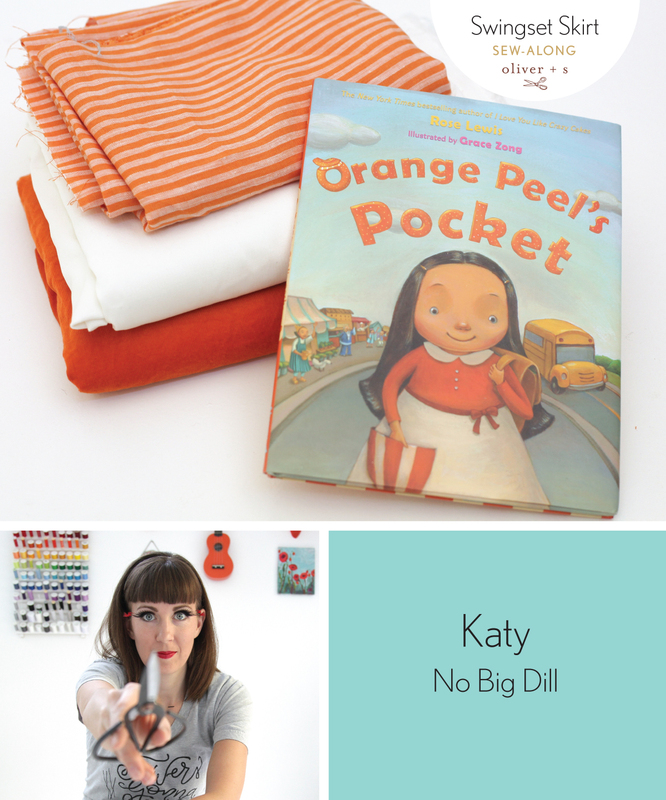 I’m Katy Dill of No Big Dill. I’m also mom to 5 girls (Divine, Pearl Estella, Olive, Azure, and Clover) and a boy (Drummer) who are my muses. I have a husband who never utters a word about my ever-growing stash of fabric. True love, right? We live in a black and white house (yes, I have white floors and 6 kids!) with 8 chickens and bunnies that keep multiplying. I have always loved sewing, but was given some really great skills in high school from Mrs. Price. I love the color orange. I love to organize in rainbow color. I play the harp and piano (they share my sewing studio). I also love giving our standard poodle different hair cuts. She never complains. Each year I host an event on my blog called “Once Upon a Thread.” It is sewing something inspired by a children’s book. Usually I take a more creative rather than literal approach, but when my 7 year-old daughter, Clover, asked if she could be the little girl in “Orange Peel’s Pocket” for the book character event at school, I couldn’t resist. My fabric choices are baby-wale corduroy and linen. Obviously I’ll be adding a pocket to the skirt, but what’s the most exciting about this project are all the little treasures that go inside Orange Peel’s pocket! Stay tuned to find out what they are! As a literature based home-schooling mom I love love love this! So excited to watch your progress. My older girls are old enough to sew for themselves or to at least help. We may have to steal your idea. I have just started a Narnia girls group. Ages 10-12. At our first meeting we all sewed stuffed pillows. They felt fabulous. Last meeting we had a 5 hour sewing marathon and they all sewed the Lazy Days Skirt. It was a blast and such a huge achievement! What a fun mom you are! I typically do picture books, but you could have so much fun seeing items based in the Narnia series! I’m not familiar with Orange Peel but am looking forward to checking out the book and sewing project as well. Once Upon a Thread is always a lot of fun. I could spend the rest of my life just knitting and sewing all those terrific Little Golden Book outfits. Sarvi, do you mean these books? http://disdressed.blogspot.com.es/2006/03/tiny-golden-books.html If so, I’m intrigued! The clothes are adorable and very worth of emulation. I’m looking forward to seeing your skirt, Katy! And also glad to hear that Once Upon a Thread will be coming soon! *That* Mrs. Price? Can’t wait to see your skirt. Did you have Mrs. Price?! Even the football players and wrestlers clamored to get into her class!